If you are involved in refrigerant leak detection, you have probably already booked a trip to the next edition of Chillventa, to take place in Nuremberg in mid-October. If you haven’t yet, N.E.T. will give you one more reason to do it. For the occasion, we will in fact launch a series of new products for the HVAC-R industry, highlighted by the IREF LITE series – an innovative low-cost, high-performance NDIR refrigerant gas sensor. If you live in Asia or the Americas, you will also find us in Beijing, China for Miconex the following week and in Atlanta, USA for AHR Expo in January 2019. Please, don’t hesitate to contact our staff for a free entry to any of the shows, or for more details on the new products. IREF LITE will make the gas selectivity, accuracy, poison immunity and extended lifetime of NDIR technology affordable for any setting, dramatically improving detection performances, increasing occupants’ safety and lowering cost-of-ownership. Chillventa is the Exhibition for Energy, Efficiency, Heat Pumps and Refrigeration and will open in Nuremberg on October 16. 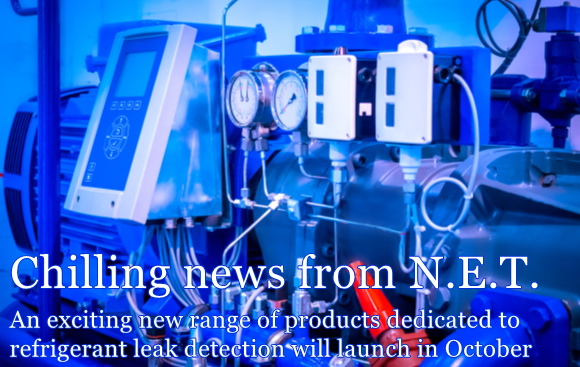 The exhibition will see the world’s premiere of our IREF LITE series, the new low-cost, high-performance NDIR sensor for A2L refrigerants. Miconex is the leading show in the field of instrumentation, automation, measurement and control technology in China. N.E.T. will display his full range of technologies, including our innovative NDIR range and the new Point-Open-Path detector for Hydrocarbons in LEL range. On October 17th, we will be talking about the ADVANTAGES OF INFRARED SENSORS FOR REFRIGERANT LEAK DETECTION IN THE COMMERCIAL/INDUSTRIAL HVACR SECTOR during Chillventa Specialist Forums. The new NET3/PL Nylon detection head from N.E.T. will bring you at a compact price all the benefits of our classic NET3 heads, including IP66 rating, front M46 thread and three possible threads at the rear (3/4”, 1” and M20).